WHEN it comes to poor people arrested for felonies in Scott County, Miss., Judge Marcus D. Gordon doesn’t bother with the Constitution. He refuses to appoint counsel until arrestees have been formally charged by an indictment, which means they must languish in jail without legal representation for as long as a year. There are many words to describe the judge’s blunt disregard of the Sixth Amendment right to counsel. Callous. Appalling. Cruel. Here’s another possibility: criminal — liable to prosecution and, if found guilty, prison time. Tonight’s entry was originally going to focus on some of the economic unpleasantness unfolding at NCCU Law courtesy of our state legislature’s emasculation of North Carolina’s university system. One of the highlights from attending the ABA’s Annual Meeting was finding out who are among the most prolific law Tweeters, most of whom used the #ABAannual hashtag to keep their followers updated on what was going on. 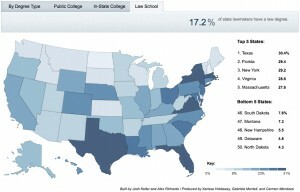 Is reasonable reliance on law school stats even possible in the Google era? David Pardue of @georgiatriallaw is one of those folks, and he mentioned this story in the Wall Street Journal about a class action lawsuit filed against Cooley Law School (by its own graduates) over the school’s disclosed employment statistics. Let me also say here (just so I don’t have to repeat it later) that the response from Cooley Law’s general counsel Jim Thelen to blame the ABA is also shamelessly disingenuous. There’s nothing at all preventing any law school from collecting and releasing far more granular employment data on its graduates — they simply choose not to do so for fear of looking bad from the results. But with those two caveats out of the way, this is another case of only focusing on the Big Bad Law Schools. I stand by the implication of my admittedly rhetorical question to David on Twitter: can any law school student who enrolled after the proliferation of Google really claim they reasonably relied on a law school’s employment statistics? Ignore the fact that you can probably count on one hand the number of law students you know who actually based their decision to go to law school in any part on a given school’s stated employment statistics; even though I’ve never met one, I’m assuming arguendo that they do in fact exist. I’m also assuming, simply because they claimed it in the complaint they filed (h/t to Above the Law for this entry on the lawsuit), that the named plaintiffs in McDonald v. Cooley are among them. Look at when these folks graduated though: 2 of the 4 graduated in 2010, meaning they began enrollment in either 2007 (if full-time) or 2006 (if part-time); the 3rd graduated in 2008, meaning enrollment in 2005 or 2004; and the 4th graduated in 2006, meaning she enrolled in 2003 or 2002. Google, by contrast, began in 1996. Its world-famous PageRank search algorithm won patent protection in 2001. It already had 50%+ of the global marketshare for search engines by the time the earliest of the 4 named plaintiffs ever decided to attend Cooley Law, reaching such ubiquity that Merriam-Webster added the verb “to Google” to the dictionary in 2006. Which brings me to the 2nd prong of this analysis: people have known law schools were juicing their employment statistics for most of the past decade. …Evidence of a squeezed market among the majority of private lawyers in the U.S., who work as sole practitioners or at small firms, is growing. A survey of about 650 Chicago lawyers published in the 2005 book “Urban Lawyers” found that between 1975 and 1995 the inflation-adjusted average income of the top 25% of earners, generally big-firm lawyers, grew by 22% — while income for the other 75% actually dropped. Sure this piece only talks about solos and government/public-interest attorneys. But I also found that in under 30 seconds earlier today. Just 30 seconds, despite 4 years’ worth of new websites and blogs and other data Google has indexed clogging up my 2011 search results. In other words, had any of these students done a same or similar search in 2007 (or earlier), they could have found the exact same IRS / BLS / NALP data indicating a difficult legal job environment in the exact same amount of time (or less!) with a much better signal:noise ratio than I’m getting now. And that’s not even getting into the “common sense” factor here: you know there’s a stagnant legal market if for no other reason than living in an economy barely recovering from the September 11th attacks (and ensuing diversion of resources to improve homeland security), and yet you really believe your law school had a 90%+ employment rate? While nearly every other law school in the country claimed 90%+ employment over the exact same time? Now I’m not the type to categorically trash all graduates from a law school, so I have to assume this “I really didn’t know! I really did reasonably rely on this data even though contradictory information from more reputable sources was literally right at my fingertips! Really!” mentality is atypical of Cooley Law graduates. Have a great Friday night and an amazing weekend everybody! State Legislatures: Where are all the lawyers?? I meant to post this for y’all when it came out a couple weeks ago, but the good folks over at the Chronicle of Higher Education put together a pretty awesome and thorough series of articles on the education level attained by state legislators in all 50 states. Now I’m not one of those folks who thinks having a college degree should be a prerequisite for public service; although I’m a big supporter of higher education, I also know some of the wisest people I know (like my grandparents) never got one. But, that point notwithstanding, it was intriguing to see this fancy interactive map with the end results graphed out — especially after clicking the “Law School” tab, where it turns out only ~17% of legislators nationwide went to law school. Maybe my perception had just been skewed by what I read in the press or learned in my social studies classes in K-12, but I was always under the impression lawyers were the dominant profession in politics. It made intuitive sense considering how needlessly complicated some of the most basic statutes can be in a given state. Yet according to the “real world” data, even in the most attorney-packed legislature in the country (Texas), there are still more than 2x as many non-lawyers as there are lawyers. Not sure what the practical implications of this info are, but thought I’d pass it on for y’all to peruse. Enjoy, and have a great night!